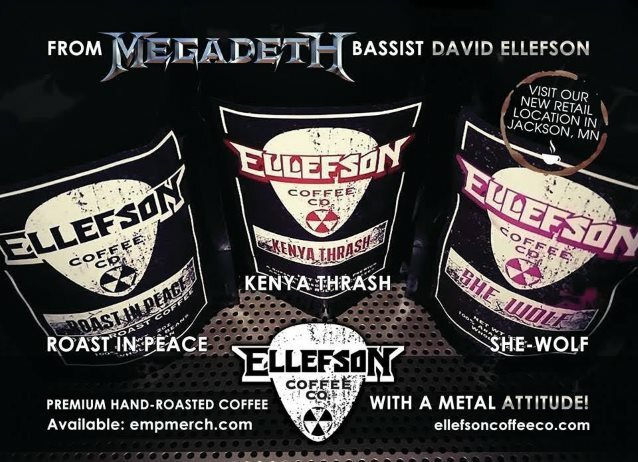 Ellefson Coffee Co., the boutique coffee brand of MEGADETH bassist David Ellefson, will open its first brick-and-mortar Ellefson Coffee Co. shop next week in David's former hometown of Jackson, Minnesota. In addition to serving a variety of custom blends of Ellefson Coffee Co. brands, including Roast In Peace, She Wolf, Kenya Thrash and Urban Legend, Ellefson Coffee Co. will be a retail outlet for Ellefson Coffee products and memorabilia, as well as a satellite retail outlet for titles and merchandise from Ellefson's EMP Label Group. The store will also serve as a "Museum Of Deth," featuring permanently displayed artifacts and memorabilia from Ellefson's personal collection, as well as memorabilia from other artists. After teaming up with local Jackson Coffee shop Coffee Choices (one of Ellefson's personal Jackson haunts) and owner Susan Reiter for their Urban Legend blend, David's Ellefson Coffee Co. (and EMP) partner Thom Hazaert suggested taking the partnership farther. "One day Susan and I had a conversation about the idea of sort of re-branding Coffee Choices into something more aligned with the Ellefson Coffee Co. brand, and us coming in as partners," says Hazaert. "I pitched the idea to David, we had already discussed the idea of opening a brick and mortar outlet maybe in Phoenix, and we all loved the idea, being David's hometown, and Susan's amazing history in Jackson, and her experience running Coffee Choices." Adds Ellefson: "I've been blessed to travel the world year after year as a musician but my roots have always stayed in Jackson, Minnesota. So, it's a true honor for our coffee brand to have a retail shop on the main street USA I grew up on, and to serve the very community I was born and raised in. Aside from some great coffee and a fun rock n' roll atmosphere, our store is a go-to destination for coffee that also tells my story of heavy metal and global music history. I look forward to seeing you there!" And any MEGADETH fan already knows Jackson well, even if they don't know it, as the connections to this small Midwest town run deep in MEGADETH lore. Loon Lake Cemetery, that spawned the legend of Mary Jane, immortalized on "So Far, So Good, So What", is a few miles down the street, while the Ellefson family farm that inspired MEGADETH hit "Foreclosure Of A Dream" is also a stone's throw from where Ellefson Coffee Co. is setting up shop. 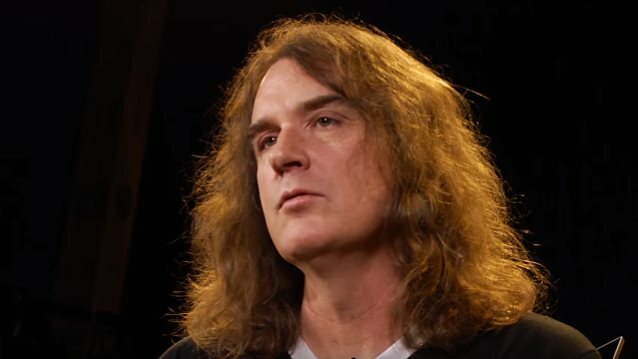 Hazaert adds: "Not only will Ellefson Coffee Co. now have a permanent face in David's hometown, but being able to tie in EMP, and everything else we do, and with the huge sense of MEGADETH history in Jackson, we are excited to be able to create a really unique and amazing fan (and coffee) experience, that we are sure will not only be a highlight for the people of Jackson, but a destination for MEGADETH fans from around the world." The first day of business officially as Ellefson Coffee Co. will be Monday, January 9, with a grand opening coming later in the spring. You can pay Ellefson Coffee Co. a visit at 404 Second St., Jackson, MN 56143.